We live in a society where first impressions count. Is there a simple way for you to stand out from the crowd & make more positive impressions in your life? 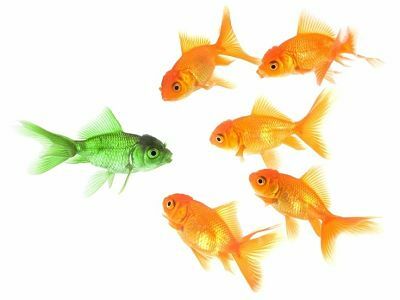 Is there a simple way for you to be that greenfish in a sea of goldfish? At a recent speech we gave to a large group of teachers, we asked the audience for a show of hands to the following question: “Who spends at least 30mins a week on their personal grooming such as fixing their hair, shaving, applying make-up, ironing their clothes or polishing their shoes?” Most of the mixed gender audience put their hands in the air. Most people invest time on improving their appearance, because they want to present well in public and make good impressions. We then asked the same audience for a show of hands to this question: “Who spends at least 30mins a week learning and practicing their public speaking and communication skills?” Less than 5% of the audience had their hands in the air. Few people invest time in improving their public speaking and communication skills. Many of you may have seen this pie graph before. It relates to a study done by Albert Mehrabian in the 1950’s. Whilst there is some debate as to whether these numbers are a true and accurate measure today, our experience shows that the use of effective body language and tonality is indeed very important when communicating your message. Effective speaking and communication involves honing both verbal and non-verbal skills. These are skills that most people are not taught nor practice. Most of us speak and communicate in public every single day. How we do it, largely influences how we are perceived in this world. The best way to stand out from the crowd is to do something different from the crowd. Investing in learning to speak and communicate well is a simple and effective way to make better impressions in your life. The good news is that you are never too young or too old to learn these skills. Whilst you can find many great public speaking tips on the web, there are also many great public speaking groups & courses and speaking workshops available that can help you or your child learn these skills. So, do something different from the crowd, start learning to speak & communicate well and start achieving more in your life today!